Nymphlike: Better identification of Lyme disease by doctors accounts for some increases in the reported number of cases. 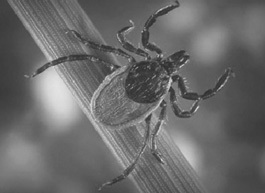 The Western black-legged tick in nymph form is the disease's most reliable transmitter. With Lyme disease infection rates tripling, why doesn't the government take the disease more seriously? IF A TICK has bitten you lately, you have cause to be concerned. In California, the number of Lyme disease cases tripled from 2004 to 2005. In fact, the Centers for Disease Control admits that the actual number of cases may be 10 times higher than officially estimated. Lyme disease is borne by ticks carrying the bacteria Borrelia burgdorferi. Western black-legged ticks, the main culprits, are especially common in mountain areas where deer and rodent populations are higher. Borrelia burgdorferi is slippery; it can change shape, go dormant, hide in the system and cover itself with a protein so antibiotics can't get to it. Although the symptoms vary, Lyme disease often starts with a red rash with a white point in the center, called a bull's-eye rash, and fever, malaise, joint pain, headache or sore throat ensue. If left untreated, Lyme disease can progress to serious problems, such as paralysis, meningitis, mental illness and neurological disease. At this stage, it can be hard to diagnose. Lyme disease has been called "the great imitator" because it can look just like multiple sclerosis, Lou Gehrig's disease and chronic fatigue syndrome, among others. Katherine Renfield knows firsthand about Lyme disease's evasive nature. In 1995, the Bay Area mortgage broker woke up in the middle of the night with a "huge flash—it felt like a fever." Hot and sweaty, she looked down and saw a tick on the back of her leg. When Renfield went in for a checkup, the doctor correctly diagnosed Lyme disease and gave her antibiotics that were supposed to clear everything up. Except that they didn't. For the next six months, Renfield experienced symptoms ranging from rashes to joint aches to migraine headaches to eye infection. Her eye doctor told her she still had Lyme disease. "I was scared," she says. "The eye infections were really dangerous, and I had been having terrible bouts of fevers where I felt hot and faint. I had never even been sick before." The eye doctor sent her to an infectious-disease doctor, who put her on another six weeks of antibiotics. For a time, the disease seemed to clear up, but soon enough, Renfield was experiencing the same strange symptoms again—only now they were getting worse. The joint pain, which came on her every month, sometimes hurt, she says, "to the point I wanted to cut my arm off." She had continuous fatigue, eye pain, headaches and fog brain. For years. "From 1999 to 2004, I just dealt with it," she says. "I thought, 'OK, this is what I have to deal with in life.'" At last, in 2005, Renfield went to a Lyme disease specialist, who put her on a combination of long-term antibiotics, anti-infectious agents and anti-malaria drugs. It seems to be working. For the last six months, Renfield has been free of the chronic symptoms that had dragged her down for nearly 10 years. Her story isn't uncommon. Novelist Amy Tan went through 10 doctors before Dr. Raphael Stricker, a Lyme disease specialist and president of the International Lyme and Associated Diseases Society, diagnosed her illness. In her case, Lyme disease had been overlooked because most doctors use the CDC-recommended ELISA test, which critics say is only 65 percent accurate. Stricker uses a test by IgeneX, a lab in Palo Alto that tests for antigens that ELISA does not. It has a 95 percent accuracy rate. Stricker believes that Lyme disease is grossly underdiagnosed. "Even the CDC claims Lyme is underreported by a factor of 10," he says. "That means that if you have 20,000 to 25,000 cases, it's probably more like 200,000 to 250,000 cases. Other people say it is underreported by as much as 40 times, which would mean you would have over a million new cases a year." The good news is that with long-term treatment, Lyme disease is largely curable, even in chronic cases. Stricker estimates that 70 percent of his patients are cured when they get the right therapy for a long period of time. "The CDC recommends a cookie-cutter approach, where two weeks of antibiotics cure most cases of Lyme, and no more than four weeks are needed," he says. "That approach is wrong. This disease needs to be treated for as long as it takes." Many doctors believe Lyme disease is not a problem because it is more common on the East Coast than it is on the West Coast. New York, for example, saw 5,100 cases in 2004 compared to only 48 cases in California. On the other hand, a study by Robert Lane at UC-Berkeley showed that ticks in Mendocino County have an infection rate of 4 percent, which is the same as the infection rate on the East Coast. Another study by the Marin/Sonoma Mosquito and Vector Control District looked at 577 ticks in San Rafael's China Camp State Park. They found a 3 percent infection rate, meaning that three out of every 100 ticks carried the bacteria. And that's just the adult ticks. In California, ticks in the nymphal stage, between larvae and adult, are the most likely to spread disease. "It's a phenomenon they don't have on the East Coast," says vector ecologist Ron Keith. "When the adult tick feeds on Western fence lizards, something kills the bacteria and renders the overall infection inactive. But in the nymphal stage, this isn't the case." With infection rates so high, advocates want to see Lyme disease taken more seriously. Congress is currently deciding whether to allocate $500 million in funding for addressing this illness. "It has been ignored by the government," says Stricker. "They spend a lot of time on West Nile virus and the bird flu, while Lyme disease needs national attention." But for Renfield, the solution may be simpler than legislation. "I would just like doctors not to scoff at patients with Lyme disease," she says. "A lot of doctors haven't really learned how complicated it is, so they just dismiss it. I don't really know why that is. It's just a bacteria, but it is a very sophisticated bacteria."